This design is likewise simple and quickly made, using a band -, jig - or fret-saw, embodying sawing, cementing and bending. The two ends are jig-sawed from 3/8" sheet. The trays consist of half a #2B cylinder, sawed in half longitudinally, the whole being cemented together as shown. All joints are sanded down smooth, the point of contact between the two pieces of cylinder also being sanded slightly so that there is a firm 1/4" contact between the two. After the entire assembly is sanded, buffed and polished, two 3/8" holes are carefully drilled at the contact of the two cylinders, spaced as shown in Figure 59, and a 3/8" rod is heated, bent, fitted and cemented into these holes for a handle, having previously been polished. Here is a very striking effect for a pennyworth or two of plastics. 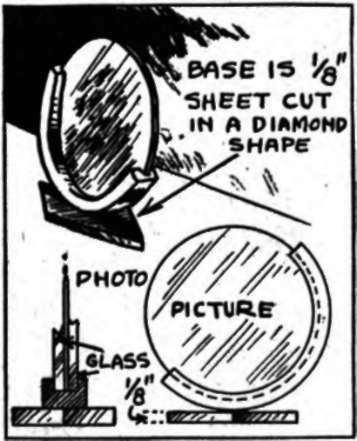 All the material required is a half of a half-inch-wide section of bracelet-cylinder, and a diamond-shaped piece of sheet 1 1/4" the short way and 2" the long way. A groove is turned inside the cylinder-section before it is halved, of a width sufficient to take (tightly) two glass discs and the photo. Other details are obvious from the sketch, Figure 60. The section is a little more than half way, thus providing a firm grip on the glass, as it "springs" when the glass is inserted. Fig. 60. A very simple and inexpensive picture-frame design for small snap-shots, using cylinder-scrap. The photo is put between the two round pieces of glass and slipped into the groove turned in the inside of the narrow cylinder-section. Materials: 1/8", 1/4" and 1/2" sheet. 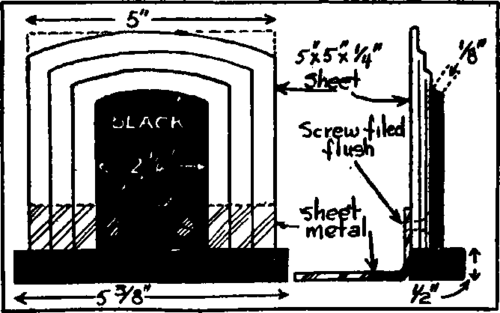 Construction-details of this strong but light-weight pair of book-ends are clearly shown in the sketch. Figure 61. 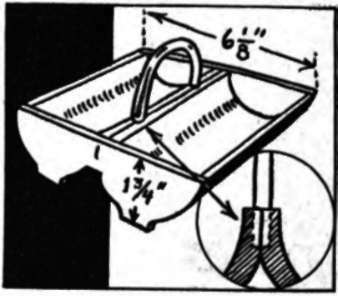 There are several means of achieving the "steps" indicated—they can either be routed out or cut with a molding-cutter (this latter requires a little experience with this type of work), they can be cut down with a file, or the entire end can be built up of four pieces of 1/8" sheet, cemented together. After assembly of the inner portion, the holes are drilled and the metal plate attached, then the final 1/8" sheet is cemented on, covering the holes, and the base cemented on. The metal sheet can either be attached to the back surface as is, or set down flush into the material. Fig. 61. Design for the pen-set described in Project 49.